Have you ever felt like every day was a struggle. You’ve grown weary in performing the day to day tasks and you wish there was more to you everyday life? Do you find it difficult to keep an eternal perspective when the world and all it’s pleasures, expectations and stresses are thrown at you daily? Have you placed other desires in place of God and relied on them for your happiness? Do you allow your worth to be determined by something you will lose? While I’m constantly learning and growing, over the past few months God has been working on my heart to find satisfaction in Him when my life is in disarray. Life gets hard and things don’t go as we planned. It’s hard to rely on God when we can’t see what lies ahead. It’s hard to trust Him when we can’t see what He’s doing. In this study I hope to share what I’ve been struggling through over the past months and also what I’m continually learning day by day. 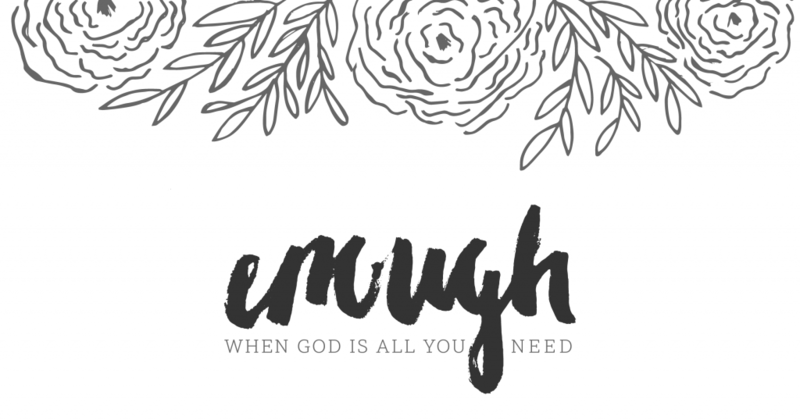 In this study I hope to share ways in which you can look at your life full of stress, worries, unknown futures and unmet desires and find peace and contentment knowing that God is enough. Below I’ll share the first part of the study – developing patience. In today’s society we have found the word “patience” becoming almost nonexistent. We want instant and immediate. With technology we have easy access to things on our time schedule and we don’t have to wait for an answer. Patience has become a hard characteristic to find with today’s society. When we have to wait in traffic for more than a few minutes we get agitated and angry. When the cashier takes longer than expected we complain. When the internet doesn’t work we become easily annoyed. While patience is one of those characteristics I easily write off as unattainable, I quickly forget that it is a fruit of the Spirit that we as Christians should be continually seeking and growing in. I’ve always been one to struggle with remaining patient during the long silent lulls in my life. It always seems like God grows more quiet than ever during these times. When I need Him most is when I feel like He’s giving me the cold shoulder. I begin to question His goodness. It is during these times that I question how His plans for my life can be of any worth. I wonder “How long?” I begin to wonder if the things I’ve been praying for and desperately seeking Him about will ever be fulfilled. Looking at my life in comparison to other’s lives has often left me feeling discouraged with God’s reasoning for where my life had ended up. I questioned why others so easily attained the very things I was desiring and seeking God about and I was left with an empty heart. I had faith that God could perform and provide the things my heart desired, but He was working at a colossal pace. Why did God provide and bless others with the things I’ve been waiting and trusting Him with for years? I began to question God’s justice and how this was meant for good. I continually still struggle with finding a better perspective in this area. Through the waiting and silent times of my life God has often felt farther than ever. The silence brought me to a place of feeling crushed and forgotten. I just wanted to feel Him near, but sometimes He didn’t make His presence known. Maybe because He knew that I already knew He had never left my side and He didn’t need to prove Himself because He promised to always be there. The Lord is good to those who wait for Him, to the soul who seeks Him. It is good that one should hope and wait quietly for the salvation of the Lord. I have grown to realize that the quiet times of my life that God felt farther than ever – the times when my heart yearned for an answer to my prayers, were the times that gave me a deeper reliance on God than ever before. When the nagging desires of my heart weren’t being fulfilled or they felt like they were growing stronger than my need for God, those were the times I needed to seek Him for strength. Although it wasn’t easy to overcome, I found God giving me strength to get through everyday. He provided a way when it didn’t seem possible. Even though it wasn’t the way I wanted it. Patience is embracing your circumstances and accepting them without questioning or complaining. Patience is looking at your circumstances and finding hope knowing that God is working. Patience is when you’ve done all you can do, and just being still. You don’t have to have the control or worry. You don’t have to carry the weight of the pressure. You don’t have to have it all planned out. You can just be still. Be still and let God work. For me, being still is often the hardest thing for me to overcome. If something is wrong or not how I want it I try to do everything within my power to fix it. I struggle with just sitting by and waiting for things to work out in God’s timing. I want to rush and get it worked out. God has a different perspective though. He tells us to “Be still and know that I am God.” I sketched this verse on my chalkboard to help as a reminder, but I really began to take a deeper look at it’s meaning recently. I’ve heard the verse many times before, but upon reading it I’ve come to better understand it’s meaning. Although it seems like common sense, I was able to find a deeper meaning to the verse that helped me through the impatient times in my life. When I’ve done all I know to do and I feel like I want to fix my problems, I can just be still. I don’t have to worry. I don’t have to continually think through my problems. I don’t have to harbor on it. I don’t have to question or doubt. I don’t have to run it through my mind a million times. I can rest because I know who God is. God promises to never fail or forsake us. He promises to provide exactly what we need. He promises to protect us. He is in control of all things. He is busy at work even when all we hear is silence. He is the Creator of all things. So we don’t have to become anxious or take things into our own hands because we can remember how great our God is. He’s got this. So you don’t have to carry the burden. You can just be still and rest knowing He’s in control. Although God promises us that He will always be with us and He will never fail us, He doesn’t say that He will answer our prayers immediately and with a fast turnaround time. When we are taught to wait for an answer it teaches us endurance and perseverance. If things came easily we wouldn’t have the opportunity to be strengthened in our character and relationship with God. We wouldn’t be learning dependence on God for our heart’s deepest desires. How many times have I grown weary with God and wondered what He was doing. I questioned why He wasn’t changing my circumstances and how much longer I had to wait. Instead I failed to realize what I could be learning and gaining from what I was experiencing right then. What is God trying to teach you right now that maybe you’ve been failing to realize when you’re so caught up in what you wish you had? Often times our circumstances don’t need to change. We do. Our hearts need to be broken in order for us to change our perspective.